I know what I’m bringing to Mom’s for Christmas brunch this year! This cinnamon sweet potato and apple bake turns the humble sweet potato and apple into something a little fancy without any fancy prep work. Once you pop the cinnamon sweet potato and apple bake in the oven, the smell of cinnamon starts floating through the house. It smells like Christmas. It’s no secret that I love sweet potatoes. You can read how I freeze sweet potatoes here. Add peeled and chopped apples and sweet potatoes to a 9 x 13 pan. Sprinkle with sucanat/rapadura. Sprinkle with cinnamon. Sprinkle with Nutmeg. Pour melted oil over the sweet potatoes and apples. Gently stir until the sweet potatoes and apples are evenly coated with oil, sugar and spices. 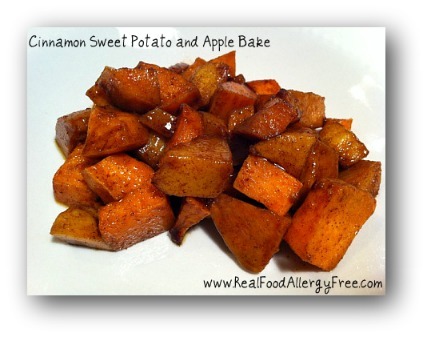 Bake for 45 minutes or until the sweet potatoes and apples are soft and lightly browned. You may also enjoy Baked Pears Drizzled with Real Maple Syrup and Two Ingredient Pumpkin Bread with Apple Cider Glaze. Mmmm I’m always looking for sweet potato recipes b/c both my boys love them! I’ve made something similar to this, but never thought to add apples to it. THey’ll love it! This looks so good! My kids will love this as a fast and healthy dessert!! I think the apples and sweet potatoes will go awesome together! Thank you!